IDF launches "Operation Northern Shield" to destroy terrorist tunnels dug by Hezbollah. 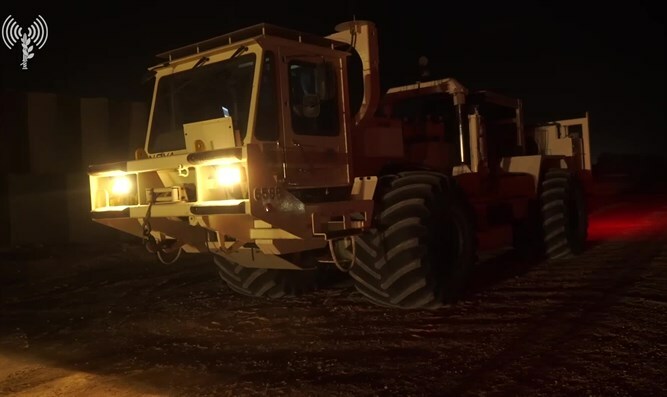 The IDF launched Operation "Northern Shield" overnight Monday to thwart and neutralize cross-border attack tunnels dug by the Hezbollah terror organization from Lebanon into Israel, the IDF Spokesperson’s Unit announced. Since 2014, a special joint Taskforce of the Intelligence Directorate and the Northern Command has been leading the operational, technological and intelligence efforts on the tunnel issue in the North. The team developed vast abilities and knowledge on Hezbollah’s attack tunnel project. This IDF operation is led by the Northern Command, in cooperation with the Intelligence Branch, the Combat Engineering Corps and the Administration for the Development of Weapons and Infrastructure. The purpose of this operation is to thwart and neutralize the cross-border attack tunnels within Israeli territory. Over the last few years and as a part of the effort against this threat, the IDF has been implementing a unique defensive plan along the northern border, including the construction of a defensive wall, the "Defensive Obstacle Project", creating cliffs and clearing vegetation. The aim of this defensive plan is to prevent the enemy from fulfilling his offensive plan and abilities. For a number of years, the IDF General Staff has been leading this effort, which recently reached the necessary operational conditions. The Commander of the Northern Command, Major General Yoel Strick, is the commander of this operation, in which significant forces are participating. “The digging of the cross-border attack tunnels that the IDF has discovered, before the attack tunnels became operational and posed an imminent threat to the safety of Israeli civilians, constitutes a flagrant and severe violation of Israeli sovereignty. In addition, they serve as additional proof of the terror organization Hezbollah's disregard of UN resolutions – first and foremost UNSCR 1701. These Hezbollah activities are conducted from the villages of southern Lebanon while harming Lebanon and jeopardizing its civilians in order to establish its terror infrastructure,” said the IDF Spokesperson’s Unit. The statement noted that the IDF has enhanced its presence and readiness in the Northern Command and is prepared for various scenarios. A number of areas adjacent to the security fence in the north of Israel have been declared a closed military zone. There are no special instructions for residents of the north. Heads of local authorities have been updated, and the IDF will continue to maintain contact with them.